Welcome to Nazareth School Preschool! Our Preschool program provides an education encompassing the experiences of a Christian community in a caring family atmosphere. We are committed to the spiritual, intellectual, social, emotional and physical growth and development of each child. 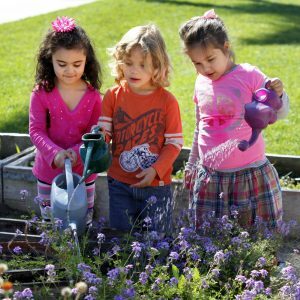 With a positive and nurturing atmosphere, we create a warm and happy place for your preschooler to learn. As we bridge the gap from home to school, we guide children as they further develop a positive self-image while building social skills in a school setting. Sensory, motor, perceptual and language skills are introduced through materials and activities which are both child-centered and teacher-directed. Work is planned to emphasize the process rather than the product, fostering a sense of accomplishment and pride. Based on the theory that children learn through play, classroom routines encourage active involvement, meaningful experimentation and reinforcement through repetition. Schedules are designed to balance structure and free choice, as well as to provide active and quiet times. While recognizing that children tend to grow in predictable stages, we treat each child as an individual. We teach a love of learning by allowing each child to experience his/her own stage of development and achievements.